What is Anders, Minkler & Diehl? Anders, Minkler & Diehl, also referred to simply as Anders, is a CPA and advisory firm that serves private companiesPrivately Held CompanyA privately held company is a company’s whose shares are owned by individuals/corporations and that does not offer equity interests in the company to investors in the form of stock shares traded on a public stock exchange, nor is it owned by a government. A company in the "private sector" refers to non-government-owned and high net worth individuals. Founded in 1965, Anders is considered one of the leading accounting firmsAccounting Firms in the USAccounting firms in the US saw strong growth in the five year period from 2013 to 2018, helped by rising equity markets, an increasing number of businesses, and overall economic growth. Revenues from US accounting services - including accounting, tax preparation, and payroll services - increased by more that 50%. in the Midwest. The firm is the recipient of several prestigious awards, including the Best Accounting Firm for Women 2017 by Accounting Today, Top 200 Firms 2017 by Inside Public Accounting, and 2015 Innovation Awards by the St. Louis Business Journal. Anders offers various services, including tax planning and compliance, audit and advisoryAuditingAuditing is a detailed examination of financial reports of an organization and is used to provide confidence to stakeholders that accounting reports are accurate. The most common audits are performed by the Big Four accounting firms for large publicly listed companies around the world., outsourced accounting, exit planning, state and local tax, forensic and litigation services, family wealth and estate planning, technology, and employee benefit plansEmployee Stock Ownership Plan (ESOP)An Employee Stock Ownership Plan (ESOP) refers to an employee benefit plan that gives the employees an ownership stake in the company. The employer allocates a percentage of the company’s shares to each eligible employee at no upfront cost. The distribution of shares may be based on the employee’s pay scale, terms of. Anders and Minkler was founded in 1965 by James J. Anders and Robert J Minkler. The partners set up their first office in the Railway Exchange Building. The company originally employed four full-time and one part-time staff at the time. The third partner, Jerry Diehl, later joined Anders and Minkler in 1969. The company rebranded in 1969 from Anders and Minkler to Anders, Minkler & Diehl LLP (AMD). 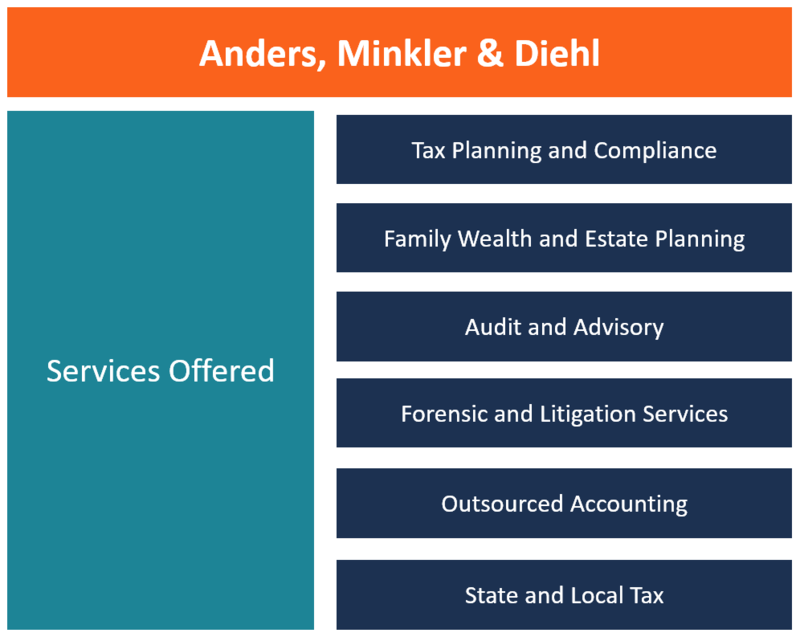 In 2013, Anders, Minkler & Diehl merged with Huber, Ring, Helm and Co. LLP. The new firm adopted the legal name Anders Minkler Huber & Helm LLP and is marketed as Anders. Both firms were two of the top-ranked accounting firms in St. Louis, and the merger enabled the company to serve a higher number of privately-held companies and individuals. The combined firm lists more than 160 partners and members of staff and revenues of more than $26 million. Anders assists their clients in crafting long-term tax strategies that help them manage their tax burden. Private companies are subject to various tax laws, both local and state laws, that they must comply with to continue operating in the jurisdictions. Also, high-net-worth-individuals with investments in several industries are likely to make mistakes when managing their tax affairs and this may lead to tax issues. Tax planning and compliance helps both individuals and businesses manage their tax affairs efficiently and find legitimate tax saving avenues without breaking tax laws. Family wealth and estate planning ensure that family wealth is preserved from one generation to another and that there are adequate controls on the assets until they are passed to the next of kin as planned. Without proper planning, there would be uncertainty on how the family estate and assets are to be managed in old age or when the family head is deceased. Some of the services offered by Anders as part of family wealth and estate planning include retirement planning, education planning, charitable giving, elder care services and estate, gift and trust planning. Anders offers independent and objective financial statement audits, as well as the assessment of an organization’s internal control systems. An independent audit helps reinforce the confidence of key stakeholders such as investors, lenders, employees, and clients on the company. Some of the services that Anders provides under audit and advisory services include due diligence, internal control assessments, financial forecasting and projections, peer review services, bankruptcy services, liquidation assistance, and audit of financial statements. Anders works with attorneys and clients in areas such as business disputes, business valuations, fraud investigations, commercial damages, business interruptions, and family law matters. The firm employs an in-house team of professionals who provide the expertise and assistance that is required in these circumstances. Anders employs a forensic and litigation services team that is experienced in valuation services, fraud and forensic services, as well as in litigation and dispute services. They serve clients facing regulatory scrutiny, divorce, family disputes, arbitration and compliance investigations, and high-stakes litigations. Outsourced accounting refers to the long-term contracting of a company’s accounting and bookkeeping to an outside accounting services provider. Anders offers outsourced accounting to business owners, family offices, and corporations that want to manage their daily, weekly and annual transactions. The Ander’s in-house team provides the companies with real-time reporting that allows clients to track their incomes and expenditures in real time. The state and local tax laws may sometimes be too complex for business owners and individuals to understand. As most states struggle to finance their budgets, businesses are finding themselves cornered by huge tax bills for taxes they never knew they owed the government. Understanding tax laws and the changes that are introduced every day can help business owners stay on the right side with the government. The Ander’s State and Local Tax team tracks tax changes, trends, public policies, regulations, and other tax areas, and advises their clients on how to comply with these laws while minimizing their tax burdens. Robert J. Minkler is one of the founders of Anders, Minkler & Diehl, and he continues to serve in the firm as partner emeritus. He is involved in the company’s Tax Services Group. Some of Minkler’s specialties include tax planning and compliance, business advisory, wealth accumulation, manufacturing and distribution, real estate and construction. He previously assumed active leadership roles in various organizations such as the American Institute of Certified Public Accountants, National Management of an Accounting Practice Conference, and Missouri Society of Certified Public Accountants. Robert is the son of the founding partner, Robert Minkler Sr, and serves as the firm’s managing partner. He holds a Bachelor of Science (Business) from Indiana University and is a Certified Public Accountant (CPA) in the State of Missouri and Illinois. Some of his specialties include tax planning and consulting, business advisory, succession planning, entertainment and sports, manufacturing and distribution, real estate, stock options, family business, estate planning, and limited family partnerships. Lorri joined Ander in 1988, and she serves as a partner in the Tax Services Group. She holds a B.S. Accountancy from Webster University and an M.S. Accountancy from Southern Illinois University. Lorri is also a Certified Public Accountant in the State of Missouri. Some of her specialties include tax planning and consulting, sports, arts and entertainment, financial management, wealth management, accounting systems, and advanced QuickBooks ProAdvisor. Private Wealth ManagementPrivate Wealth ManagementPrivate wealth management is an investment practice that involves financial planning, tax management, asset protection and other financial services for high net worth individuals (HNWI) or accredited investors. Private wealth managers create a close working relationship with wealthy clients to help build a portfolio that achieves the client’s financial goals.